Check PowerSchool to see what you are still missing. NEW ASSIGNMENT: At the very beginning of the year you created a screencast about your tech experience. Today you will create a new screencast to update this. You have all grown tremendously this year in your ability with technology. Think about all that you have done and learned this year. What can you do now that you didn't know how to do when you started this school year? Create a 2-4 minute screencast to show some of the things you have learned this year. One possible way to do this would be to walk your viewer through your website, talking about each of the assignments and what you learned in the process of completing each one. 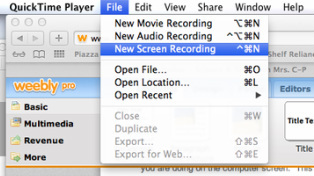 Remember, in a screencast your viewer can hear your voice and see what you are doing on the computer screen. This is not a video of you talking while your viewer watches you talk. 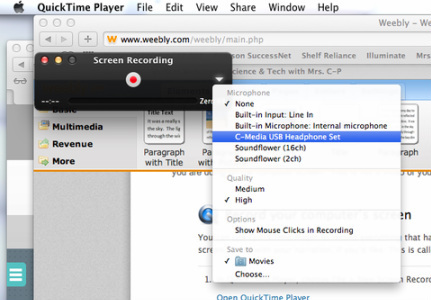 Post your screencast to your website when finished. For groups that were able to record video on Friday, you will edit your video today to create a short video to show your experiment and results. Reflection Essay - due Friday, May 24th, by the end of the hour. Click here for assignment details. So far I have seen 3 groups Physics Experiment plans and approved 1. If you have not submitted your plan for review you MUST do that today or you and your group will not be permitted to go to the park tomorrow to complete the experiments. Your group will be given a mandatory writing assignment to complete in place of the Physics Experiment video. Be sure to discuss what materials you need for your experiment and who is bringing them tomorrow! Many of you have still not provided website feedback to your assigned partner and/or sent me an email regarding the changes you have made to your website. This can include what you are happy about in terms of your website or a page that you are particularly proud of. Several of you still have not completed the Journal Assignments from Monday. See these below and complete them. Complete your website buddy check using Google Drive and/or via email. Be sure to share the document with me or copy me on the email that you send. Read your buddy check feedback and make adjustments to your website. Make sure that you have a way of showcasing your best work. Send me an email outlining the changes you have made to your website in the last two weeks or so. Any student not yet finished with Career Cruising MUST complete this today! Show each completed section to our guest teacher for a stamp of completion. No working on the "Good Time" (described below) until you are finished with CC! Garrett K., Lucas F., Joshua M. - see guest teacher for USB flash drive containing 2nd grade student stories. Using iMovie (and the "Student" account), work together to create a single movie containing each student's story. Use the "Erosion Examples" video I showed in class this week as a guide. You may add appropriate music in the background, just keep in mind it is the "background". Please note which computer you are working on and save the finished product to the flash drive if you complete it today. Please stay somewhere in the classroom to do this as your input on the project below is also required. We are going to have a "Good Time" in class on Friday. Look up information about "Lip Dub". You may begin your information search here. A fellow teacher has challenged us to have a "Good Time". His students have already created their Lip Dub and now it is our turn. I'm hoping you will be able to view these videos (Our guest teacher can show them with the projector and my computer). If they don't work here at school, please take a moment to watch them when you get home to get an idea about the plan for tomorrow. You will enjoy them. using your notes to "stay in the loop". product! Work hard, be creative and have fun! sent out today you will not be permitted to participate in our "Good Time" Lip Dub on Friday!